Are you a master hunter of hashtags? Are you able to analyze data and find interesting facts where the others only see boring numbers? Are you also able to spot the newsworthiness of those facts? Then, this deal is for you! You use hashtagify.me to search and analyze some hashtags of your choosing, and find some surprising, or funny, or useful facts. After we're finished publishing all 8 blog posts of the series, we ask our users and an expert jury to vote them. If your post comes out on top, we give you the $2,000 final prize. And that's not all. We need to add a social media analyst and blogger to our team, and we're really looking forward to use this opportunity to find the best candidates. Are you interested? The following Terms and Conditions apply to the Master Hashtag Hunter competition (the “Competition”) organised by Cybranding Ltd (the “Promoter” or “We” or "Us"). 1.1 The Competition is open to all persons worldwide aged sixteen (16) and over. NO PURCHASE OR PAYMENT IS NECESSARY TO ENTER OR WIN THIS COMPETITION. 2.1 In order to enter the Competition, you will use Hashtagify.me to search and analyze one or more hashtags, and email to us a post with the results of the analysis. To win the Competition, you shall find some surprising, or funny, or useful facts and trends, newsworthy for the general public, or for social media marketers. You are encouraged to use all the tools of Hashtagify.me to produce the analysis, including those labelled “Beta” and “In-Depth Intelligence”. 2.2 You can use all the tools of Hashtagify.me free of charge for the whole duration of the Competition. That includes the free use of tools that are usually paid tools (namely the “CyBranding Hashtag Intelligence” service). In order to get free access to the paid tools, write an email to reward2013@hashtagify.me, also specifying which hashtags you're interested into. 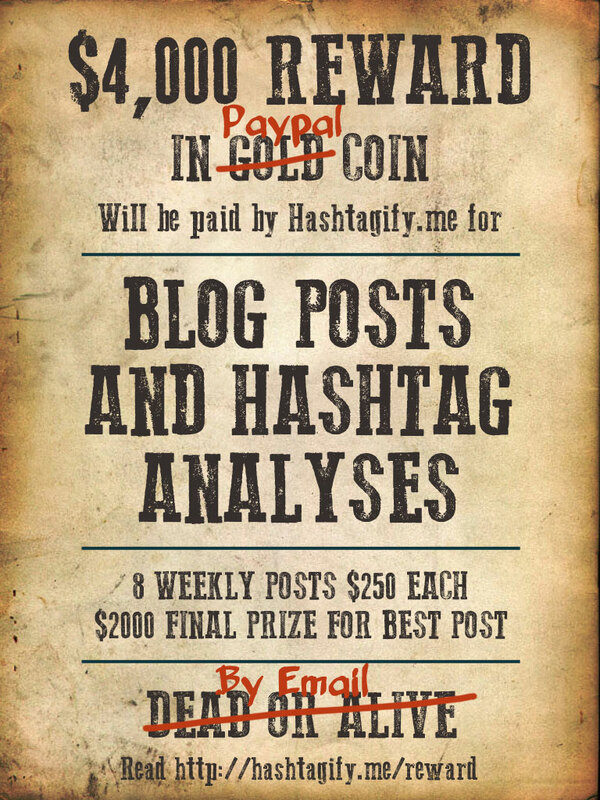 2.3 You shall email the analysis, written in the form of a blog post, to reward2013@hashtagify.me (the “Entry”). We are used to posts between 500 and 1500 words, but at the end only quality matters, not quantity. So feel free to send shorter or longer posts. 2.4 Entries are unlimited. You can submit as many posts as you want. However each email shall include only one Entry. Third party or bulk Entries will not be accepted. 3.1 Entries must be submitted from Friday 8 November 2013 at 9:00 a.m. (GMT) to Sunday 19 January 2014 11:00 p.m. (GMT). No Entries received before or after this time will be accepted. The winner of the final prize will be selected on Sunday 16 February 2014 among the winners of the weekly prizes. 4.2 Each week, the Promoter will select at its own discretion the “Best Post of the Week”, awarding a $250 prize to the author. The post will be published in our website blog.hashtagify.me and promoted around the Internet. 4.3 The Promoter has the right to select more than one Winner of the Week, if in its discretion multiple Entries reach the winning level of quality. In this case, each Winner of the Week will receive the full prize of $250. 4.4 The Promoter has the right to select no Winner of the week if, in its discretion, none of the Entries received reach an adequate level of quality. In this case, the prize for that week is cancelled or moved to the next week. 4.5 The winner of the Final Prize of $2,000 will be selected among the Winners of the Week by a panel of external experts (50%) and the vote of the public (50%). Popular vote. Each Hashtagify.me registered user can vote once for each Post of the Week, assigning a vote of 1, 2 or 3 stars. We will sum the stars received by each post to compute the popular vote standings. The post with the highest number of stars gets the 1st place. Jury panel vote. Before the end of the competition, we will appoint a panel of experts. They will assign each Post of the Week a vote of 1, 2 or 3 stars. We will sum the stars given by the jury to compute the jury panel standings, just like for the popular vote. Winner. The vote of the public and the vote of the jury count 50% each to select the winner. In case of a tie, we will ask the Jury to cast a new vote. If it's a tie again, we will split the prize between all the posts in the tie. 5.1 Any personal information collected from the Entrants specifically for this Competition will be used only to manage and fulfill the Competition. Such information will not be used for any other purpose than as stated in these Terms and Conditions or as separately accepted by the Entrant. Any personal data provided by the Entrants will be held and processed in accordance with the requirements of the 1998 Data Protection Act. 6.1 Any Entry (including the images) submitted become the property of the Promoter and will not be returned. However we will always publicly acknowledge your name as the author. As an exception to the rule, we will return you a non-winning Entry, if you request to publish the post to your website or a website you know (provided that you keep a reference and a link to Hashtagify.me as the source of the data). 6.2 The Winner(s) will be notified by email and announced on our website and the media. If the winner doesn’t claim the weekly prize or final prize by February 2nd 2014 at 5 p.m. (GMT), the Promoter reserves the right to offer the prize to the next winner based on the judging criteria, or to delete the prize. The Winner(s) are required to provide a valid Paypal account before the date. 6.3 The Winner(s) agree to the unrestricted use of the Entry in any Competition and post-Competition publicity by the Promoter, including but not limited to press release, post, and any media promotion worldwide. In particular, the Winner(s) agrees to allow the Promoter and its designees the perpetual right to use their names, photographs (if any), and biographical information, for promotion, trade, advertising, in any media worldwide, including but not limited to on the internet, without notice, review or approval and without additional compensation, except where prohibited by law. 6.4 The Promoter reserves the right to withdraw or amend the Competition and these Terms and Conditions in the event of any unforeseen circumstances outside of its reasonable control or if in its absolute discretion consider it necessary. 6.5 No responsibility is assumed by the Promoter for technical problems or malfunction which may affect the Competition, including but not limited to the inability to receive or send email, failure to receive the Entries appropriately (e.g.. if the Entry email ends up in our spam, we will probably not read it), inaccessibility of any website, unauthorized intervention in the Competition (i.e. hacking, tampering, viruses, etc. ), etc. Promoter is not liable in the event that any portion of the Competition is cancelled, terminated or suspended due to weather, fire, strike, acts of war or terrorism, or any other condition beyond its control. 6.6 By entering this Competition, entrants agree to be bound by these Terms and Conditions. All entry instructions for the Competition form part of these Terms and Conditions. 6.7 If any dispute arises out of this Agreement, the parties will attempt to settle it by mediation. Failing to agree the appointment of a mediator within 10 days of the service of a Mediation Notice, any Party could ask the Centre for Effective Dispute Resolution in the United Kingdom to appoint a mediator. 6.8 Subject to the mediation clause above, English law governs this Competition and each party submits to the exclusive jurisdiction of the English courts. 6.9 The Promoter of this Competition is Cybranding Ltd, 3rd Floor, 86-90 Paul Street, London EC2A 4NE, United Kingdom. You are free to choose any idea you like for the articles. To guide you, though, we created three briefs about things that we would for sure like. We just released in closed beta a new features: Popular hashtags top charts. We already did an analysis of these charts, which we have for several different languages, and found some interesting facts that could be a good base for an article. Some of these findings are specific to just one language, while others are common to more than one, but they all need a deeper investigation to find all the juicy details, and to update the data to the latest evolutions. If you want to try working on this brief, we'll send you what we already have; just write to reward2013@hashtagify.me specifying "Brief 1" in the subject. You can start from our data to complete your own analysis and write a post to send us. You're also free to use this exclusive data to write posts to publish elsewhere, for example to write about the charts in a specific language - in that language. You just need to wait until we end our embargo, that will last until we release the new feature to everybody, before publishing. And, of course, you'll have to cite and link the source of the data! By writing to as you agree to these conditions. Starting from the facts and insights you found during the analysis, you can write a blog post that describes those findings in the most compelling way you can, tying them to the release of our new "Popular hashtags charts" feature. Keep in mind that the target audience for these articles are social media marketers, but they can also cater to anyone interested in hashtags. On hashtagify.me you can find a chart of the distribution of tweets for a given hashtag in the days of the week and the hours of the day. What we want is for you to analyze this data, and find some interesting, and/or surprising, and/or curious facts or insights related to the days/hours distribution for some hashtags of your choice. The best would be to discover some facts that would be useful to a social media marketer wanting to actually use the hashtag, but even “just curious” facts could do. These findings will then be used in a blog post that will illustrate the hashtagify.me feature. To make the article even more interesting, it would be best to find an explanation of the facts, for example examining other data about the hashtag you can find on hashtagify.me or elsewhere, eg. the top languages (does the hashtag have different meanings in different languages? ), influencers, related hashtags etc..
You could also use some example tweets to illustrate the facts or the explanation, and/or explore the background story behind the hashtag. On hashtagify.me you can find a chart of the trend of any given hashtags during the last 2 months. You can also compare different hashtags, adding them all to the same chart. We want you to analyze this data, and find some interesting, and/or surprising, and/or curious facts or insights related to the trend for some hashtags of your choice. These facts will then be used in a blog post that will illustrate the feature. To make the article even more interesting, you will explore the background story of the most interesting hashtag(s) you found, by doing some searches on the internet, and collecting links or snippets from the best sources. If the background story can be a human interest one, even better.